Last night, my wife’s cousin visited our house asking for help with the problem that she has. Apparently she’s trying to find out the list of teachers selected for Teacher’s Certification for the year 2012. She wants to know whether anyone from her school is selected. Apparently finding this information is quite though. After scrutinizing Indonesia’s Education Ministry’s website, we discovered this Informasi Peserta Sertifikasi website. Unfortunately, this website is not user-friendly. We can only search by NUPTK (Unique Number for Teachers and Education Staffs). The other method is listing down all records based on Province & District. From bad to worse, when I said listing all records based on Province and District, it means you need to click page per page. Because it only shows 20 records in a page. So imagine if your district has thousands plus teachers selected. It means now you need to go through more than 50 pages, if you’re one of the unlucky people listed in the last pages. Yes, it is using AJAX. But I think they’re not doing it correctly. Instead of giving the data in JSON format, its back-end server decided to give a formatted HTML. 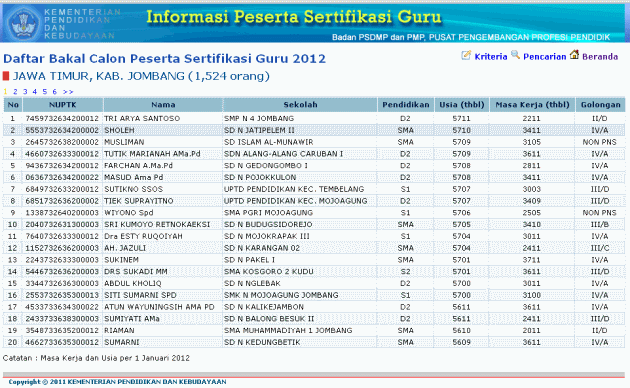 As a result, it is almost impossible to find out whether someone from SMK Al Ikhsani, Podoroto, Jombang selected for Teacher’s Certification 2012. Who has the time to skim through 76 pages (Jombang has more than 1500 teachers selected). Luckily, I know some kungfu :D. So I write a simple program using C# to automate downloading the records for Jombang district. While doing that, I realize that not only us would have trouble finding data using that lousy user interface, Everyone does! So I modify my program again, this time it will download all the records, and properly arrange them in zipped archives based on the Province & District. There you go 😀 I hope this will help you all. terima kasih atas segala informasinya…like this site. kapan kira-kira pengumuman hasil PLPG rayon 101 unsiah…??? Ya..?? apakah bs kami dapatkan info sertfikasi terbaru via email/facebook?? apa bisa kl sertfikasinya lgsung ditranfer ke rekening masing2?